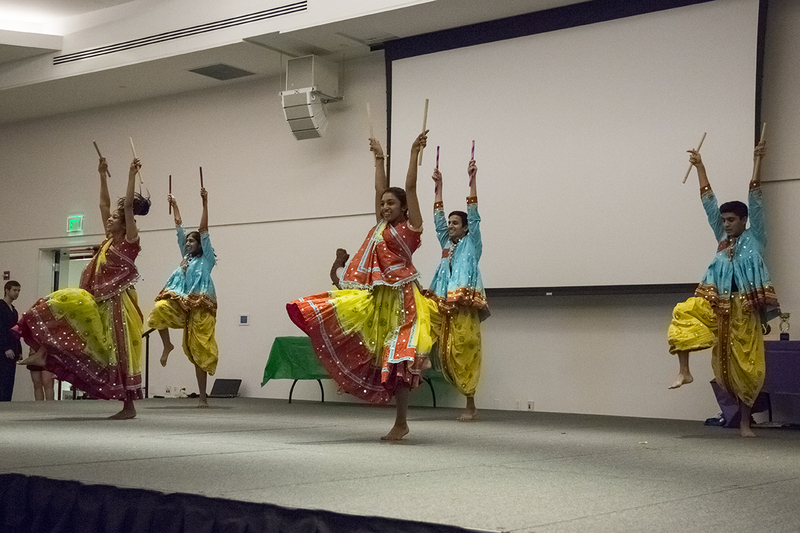 Members of SwaggeRaas, UM’s Garba-Raas team, preform in the SAC ballroom during Sunday’s Dance Marathon event. Garba-Raas is traditional dance of the Gujarat state in India. University of Miami’s annual Dance Marathon (UMDM) aims to raise money and awareness for Children’s Miracle Network (CMN) hospitals. Past UM Dance Marathons have raised over $28,000 Miami Children’s Hospital, the local CMN hospital. This year, UMDM raised an additional $10,000. The University of Miami’s seventh annual Dance Marathon (UMDM), an event dedicated to raising funds for the Miami Children’s Hospital, brought together students to dance the night away at the Student Activities Center (SAC) ballrooms Sunday to benefit children. A total of 318 dancers participated in UMDM, not including students who registered at the event. The dancing was in support of UMDM’s slogan: For the Kids, aiming to bring social awareness about the issue as well as provide financial and emotional aid to families and children being treated at Children’s Miracle Network Hospitals. Miami Children’s Hospital survivor Ralphie, 5, walked onstage during the event while being cheered on by the group of members and students present. Ralphie represented the impact UMDM has on childrens’ lives through its fundraising initiatives. Overall Co-Chairman Miranda Goot said the motivation behind UMDM was to build relationships between the campus and Miami Children’s Hospital. “We hope to build a better relationship with the hospital and see students get more involved,” Goot said. Goot said the children in the hospital network is what motivates her. Each year, UMDM tries to raise more many than the previous year. In 2013 the event raised approximately $11,000. This year, it raised $15,624. “…That’s the goal: to do better every single year,” said Jade Wollschlaeger, campus life co-chairman. UMDM is held every year in the fall. There is a registration fee to register, and all participants are encouraged to raise as much as possible for the hospital’s children. “Miami Children’s Hospital and the Children’s Miracle Network Hospitals in general donate millions and millions of dollars for kids to have uncompensated care, which is incredible,” Goot said. Fore more information on UMDM, visit canesdm.com.